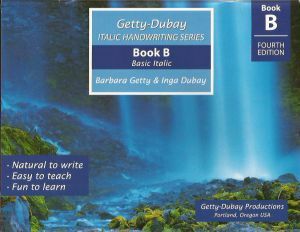 Getty-Dubay Italic Handwriting is modern handwriting style that is clean, smooth and unadorned for Kindergarten through Seventh grade. There is also an adult program available for older students and parents. There are few changes between the lowercase and capital letters other than size. The transition to cursive is simply a matter of learning to join the individual letters. Beverly L. Adams-Gordon highly recommends this program for students with learning challenges of many types. Boys particularly seem attracted to this no nonsense style of handwriting. Beginning with Level C, writing practice material is on a few particularly interesting themes. Activities guide students through the "Look-Plan-Practice" approach to self-assessment. This approach enhances legibility while encouraging your student’s responsibility for his own progress. This complete program is very reasonably priced. It only requires one teacher’s manual that covers all levels of the program. It is the same price as the student workbooks. This will save families a lot of money over time. You will love the ease of using this program and the success your students will have with it. Order yours today. You may view a sample page from each Workbook by clicking the link provided on its description. 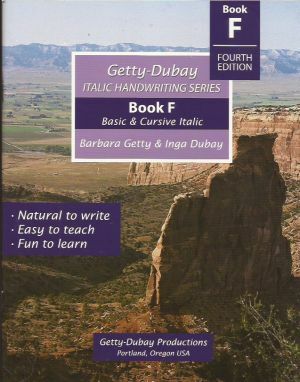 Even if you've never taught handwriting, you'll find the Getty-Dubay Italic Handwriting Series easy to follow and full of step-by-step guidance, tips, and creative practice materials. 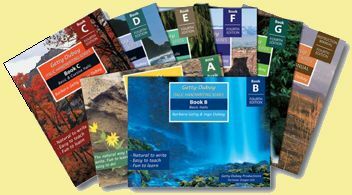 Each of the eight books in the series has been designed to utilize the child's natural curiosity and thirst for learning. The unique "Look-Plan-Practice" approach to self-assessment enhances legibility while empowering the child—encouraging responsibility for his or her own progress. Legible. Italic letterforms are uncluttered (no loops! ), even when written rapidly. Logical. The transition from printing to cursive is straightforward and intuitive. Letter shapes remain the same from basic italic to cursive italic, eliminating the abrupt leap from "ball and stick" to looped cursive seen in other programs. Easy to Write. The elliptical shapes and strokes of italic conform to natural, rhythmic hand movements. The letters are formed easily and quickly. Easy to Teach. The Getty-Dubay Italic Handwriting Series provides a clear, concise, step-by-step approach with opportunity for lots of practice. Write Now is a self-instructional course in Italic Handwriting designed for High School students and above. 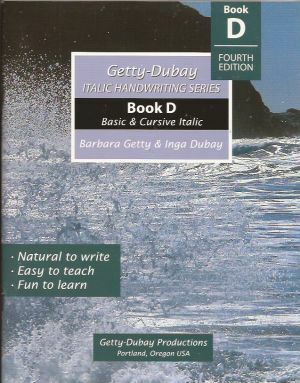 The transition book from basic to cursive italic. Basic writing practice themes: modes of transportation (automobile through zeppelin), days of the week, months of the year, and sentences. Capitals practice: cities of the USA. The simple transition to cursive italic is introduced. Includes numerals. Illustrated. (Letter height 9 & 6 mm). The final book in the Series contains basic and cursive writing practice to acquaint the student with the history of writing. Content includes writing materials such as papyrus, parchment, paper and pens as well as eight scripts developed from the Roman Era to the 17th century. Cursive capitals practice shows the historical development of each letter. History of numerals. Part 3: edged pen writing. Illustrated. (Letter height 9, 5, & 4 mm). 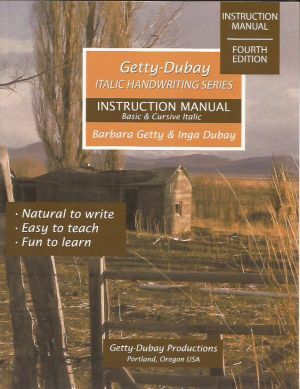 Designed for use with Books A–G, this invaluable guide contains detailed instructions for teaching letter families, capitals, cursive joins, assessment strategies, techniques for increasing speed and developing style, plus the history of writing. 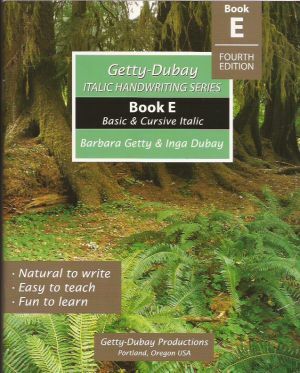 Complete information provided to effectively teach italic handwriting. 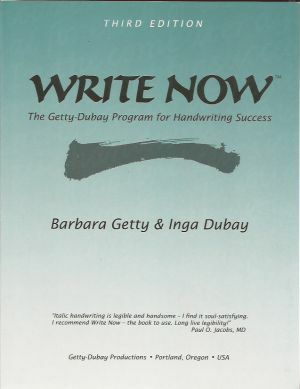 Barbara Getty and Inga Dubay's Getty-Dubay Italic Handwriting Series has been in continuous use since 1979 in public, private, and home schools throughout the country. 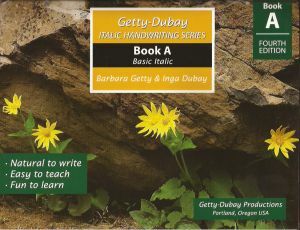 The Getty-Dubay series provides step-by-step guidance useful to teachers as well as the self-taught student. This set includes all 7 Student Texts (Books A through G) as well as the Instruction Manual. Italic Handwriting set of 8! Write Now contains complete instructions as well as practice exercises and tips. 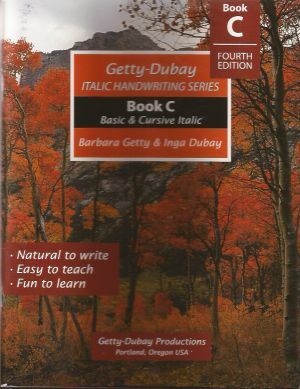 The new edition includes a supplementary section with a complete review of basic and cursive italic. The content for practice is the history of writing. Write Now is an easy way to develop a better hand at your own pace. Just a few short weeks will have others admiring your new handwriting skills. Write Now also includes the historical development of Roman capitals such as well as the development of lowercase letters. The looped cursive handwriting most of us were taught was simply not designed to accomplish the necessary combination of legibility, speed, and ease. Rhythmic patterns of sloped elliptical shapes follow the natural movement of the hand. These handsome letterforms are as easy to write as they are to read. These simple, narrow, slightly sloping letters were designed for both legibility and speed. Italic is a fast, and efficient and practical writing style that eliminates the loops and flourishes of conventional handwriting. Friends and business associates will appreciate receiving legible and distinctive handwritten messages. New in this completely handwritten, revised edition of Write Now is an ergonomically efficient alternative pen hold offering relief to those individuals who tend to grasp their writing instrument too tightly. 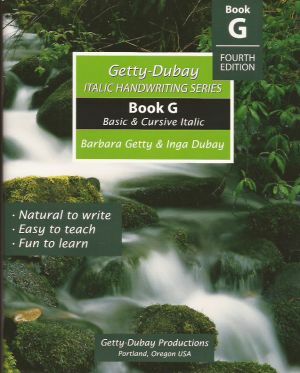 You are viewing the Getty-Dubay Italic Handwriting program recommended by the author of the Spelling Power program.